Upgrade your riding life for just two hours and $75. 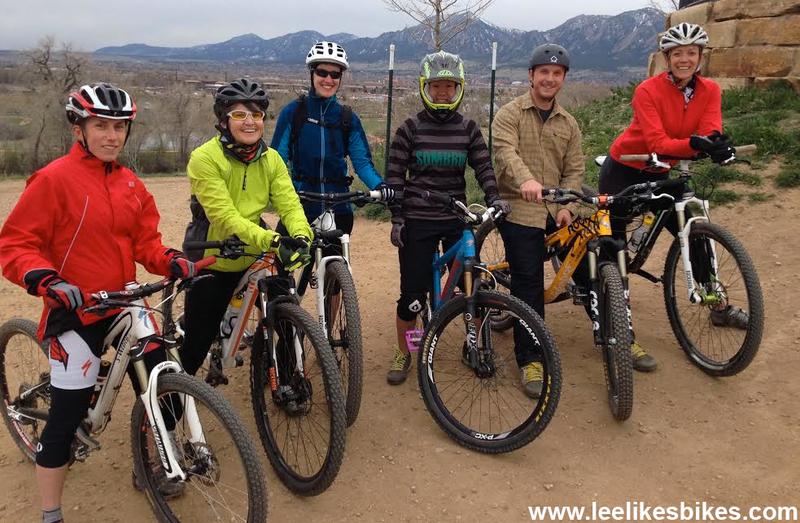 Lee Likes Bikes is a Valmont Bike Park Official Adventure Provider specializing in adult skills clinics. 20 percent of your clinic fee goes straight to the park. For children’s programs check out fellow Valmont Bike Park Official Adventure Provider Avid4Adventure. No matter what you want to do on your bike, we’ll teach you the skills to do it safely. 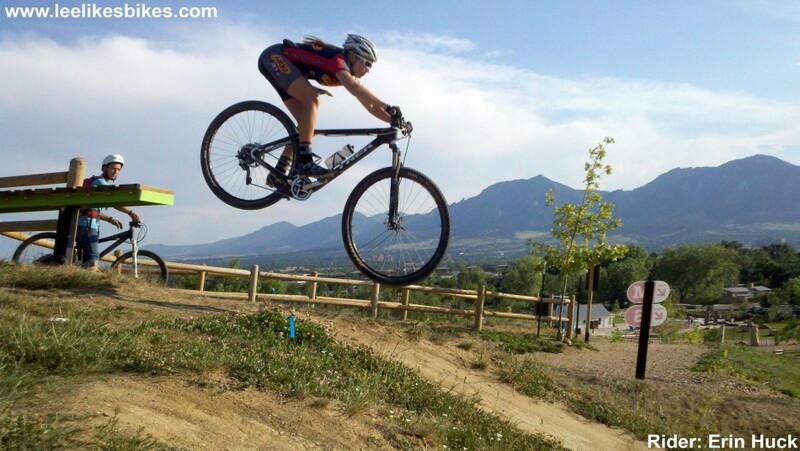 Pro racer Erin Huck with perfect flight. At LLB we believe the greatest improvement comes from a combination of individual learning and practice and in-person time with a qualified instructor. Lots of riders all over the world—beginners to pros—are reaching new levels of shred with the LLBMTB online mountain bike school. When you combine the online learning with an in-person clinic or group ride, your skills — and fun — will skyrocket. For the first time ever, when you sign up for an in-person LLB experience, you’ll receive a subscription to the LLBMTB online mountain bike school. We'll send details after you register. 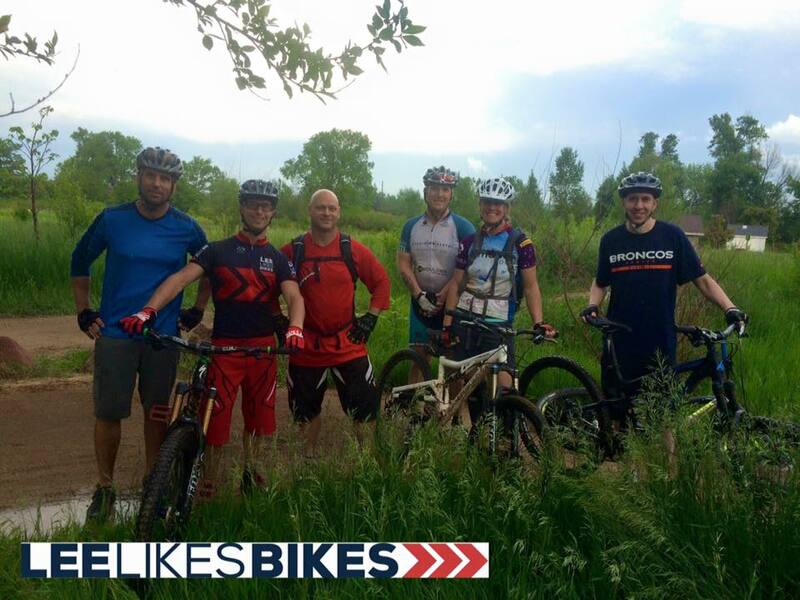 Most public sessions will be led by LLB coach Kevin Stiffler, Lee McCormack or another Lee Likes Bikes instructor. All LLB instructors follow the same curriculum, employ the same methods and are great teachers. We are professionals who love bikes and love to teach. We are, quite simply, the best in the business. Hi, my name is Lee McCormack, and I like bikes. I’m considered one of the world’s top authorities on riding technique. I wrote and illustrated the bibles of MTB and BMX riding: Mastering Mountain Bike Skills 2nd Edition and Pro BMXSkills. MMBSii is the best-selling MTB technique book in history, and it’s available in seven languages. PBS is used as the coaching manual for the U.S. and Australian national BMX programs. They’re both pretty good books. As the skills development director for the National Interscholastic Cycling Association, I create the curriculum used to teach high school mountain bike racers how to ride safer and faster, and I teach the coaches how to teach the riders. All of the instructors I hire to teach at Valmont Bike Park use the same proven methods used to train riders throughout the U.S.
Come on out: As great as mountain biking is now, it’s about to get way better! “Kevin, you and Amy knocked it out of the park today with your instruction. I now see where many of my faults were…I had gotten terribly sloppy and would never had noticed if not for this camp. “Yes, Kevin and Amy…I will work on dropping my right heel! 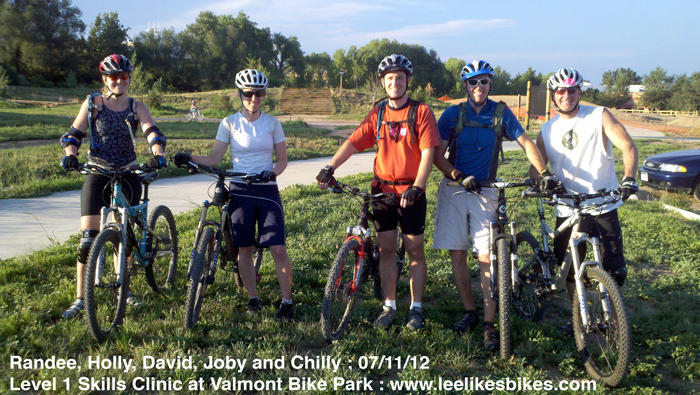 Randee, Holly, David, Joby and Chilly were stoked after their July 11, 2012 public clinic. Everyone was railing turns, ripping the pump track and riding right over a huge rock. 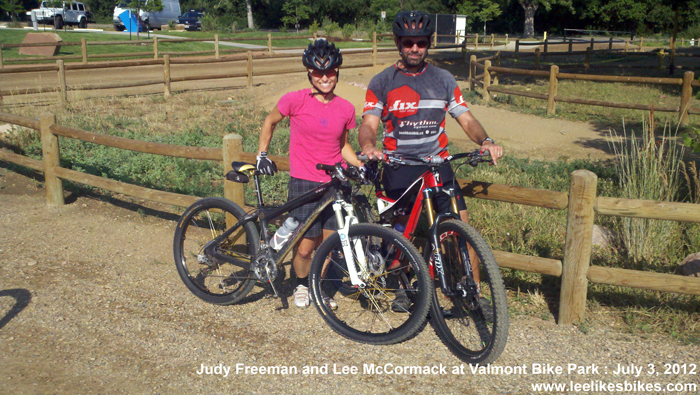 Pro XC racer Judy Freeman got in one last training session before heading to nationals. Sarah, Ann, Kate, Amy, Ben and Lauren. See 2014 public clinic #1 was awesome! I just want to thank you for an awesome clinic last night. You really excited me about the world of mountain biking. I’m brand new to the sport and kinda thought it was, ‘okay, just hang on and pray you make it over that stump…’ But, now, after learning about position and being “low and awesome” not “high and afraid” it is a whole new concept. I feel more balanced, more confident and a lot less afraid. I can’t wait to go back to the park to practice in those bumps… Maybe some day I’ll be like Amy and Ben flying over those jumps… well, maybe not in the near future, but, it sure is inspiring. Thanks again for such a great introduction to the sport. PS: i went out and bought your Mastering Mountain Bike Skills book last night after the clinic. Lee – your coaching was absolutely fantastic and so immediately applicable. It’s an amazing feeling to leave a 2hr session armed with so much more confidence in riding than at the start of the clinic. It was great to meet everyone and good luck with your riding!! My buddy Craig and I really enjoyed the clinic today. As experienced riders we were both looking for a way to take it to the next level, and I think we’ve planted that seed. We spent an hour or so after the clinic in the park and enjoyed putting our now perfect cornering and balance to work. I wish I would have had this type of coaching when I was racing 10 yrs ago…better late than never. Lee works his own kung fu on Valmont Bike Park's upper pump track. Always learning, always teaching.